1. A person carrying a Loony Toons umbrella gets off the escalator I’m getting on. 2. The jackhammering going on beneath my window at work ends for the afternoon. 3. The pitter patter of raindrops on the tree and against the railing and the air conditioner lull me to sleep. Category: three beautiful things. There is/are Comments Off on rain gear, quiet, and it’s raining. Today’s Top Ten Tuesday topic, hosted by The Broke and the Bookish, asks participants to name ten books we plan on reading this fall. Kendall Kulper’s Salt & Storm: Kendall and I were Cybils judges together in 2012 and her debut novel was published today. Eliot Schrefer’s Threatened: Honestly, I can’t tell you why I haven’t read this yet. It was on this summer’s TBR pile and I just didn’t come back around to it. Anne Bronte’s Agnes Grey: This is one of my college roommate’s favorite Bronte novels, so seems only fair I get around to reading the copy I’ve had since 1987. Helene Wecker’s The Golem and the Jinni: I put this down earlier in the year and am eager to get back to it. A library copy is currently in my possession. Knitting Yarns: Writers on Knitting (edited by Ann Hood): Rudi bought this for me for Russian Christmas last winter and periodically it whispers to me that it’d like to be read. As cool weather comes back around, it seems like a good time to pick it up. Barbara Kingsolver’s Flight Behavior OR The Lacuna: One of these is getting read this fall. Whichever hooks me in 50 pages gets the nod. Jasper Fforde’s The Eye of Zoltar: I believe there is a law that dictates I must read every Jasper Fforde book within a year of publication. The third book in the Dragonslayer series comes out next month. Jacqueline Woodson’s Brown Girl Dreaming: Recently published, this verse memoir was just listed as a contender in this year’s National Book Awards and got a ton of pre-press love in my Twitter feed. Sarah Mlynowski’s Bras and Broomsticks: Because witchcraft and Halloween go hand in hand? My True Love Gave to Me: Twelve Holiday Stories (edited by Stephanie Perkins): A dozen Christmas stories from some of YA’s best writers? Count me in! How about you? What are you hoping to read before year’s end? Category: books. There is/are Comments Off on top ten books on my fall tbr list. 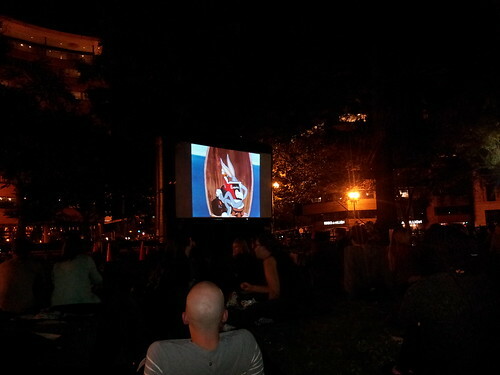 I had a pleasant weekend that began with an outdoor film in the park at Dupont Circle. As is proper, they began with Loony Toon cartoons and then moved on to The Maltese Falcon. I’ve seen the end several times, but had always missed the set-up, so it was nice to see that part this time. The weather was a little cool and I hadn’t brought a warm enough layer, so I dozed a bit in the later sections. We followed that by coming home to our cozy apartment and pulling up a French animated film on NetFlicks: The Painting. 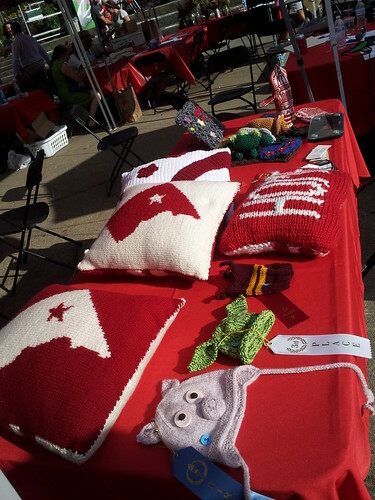 Here you can see the entries into the crochet and knitting categories (there was the D.C. flag category and the baby hat category). 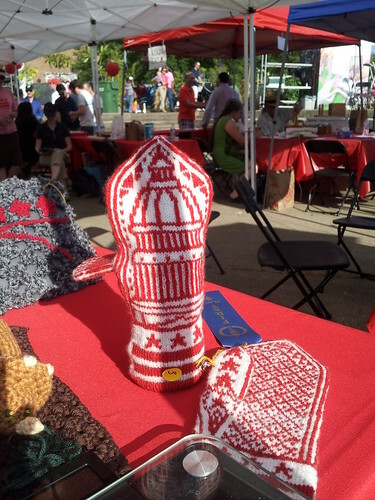 Aren’t the first-place mittens lovely? The Coffee Bar was only a few blocks away and I cajoled Rudi into going there instead of home. He was glad once we had drinks and chairs, and we ended up staying until they closed. 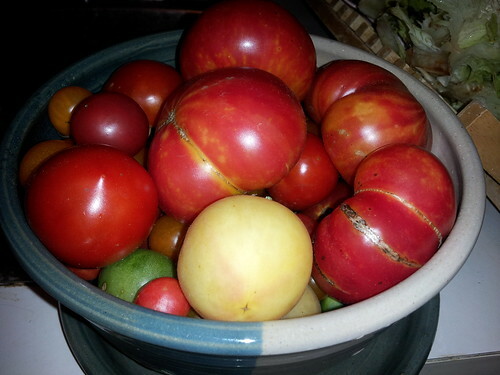 On Sunday, while Rudi was riding his first 100-mile bike ride of the year, I slept in, hit the farmers market, came home to veg for a while, and then remembered the Corcoran Gallery is closing for an indeterminate amount of time beginning next week. I biked down there and spent a couple hours looking at art. I took a bunch of photos, so maybe I’ll post about that in more depth later. 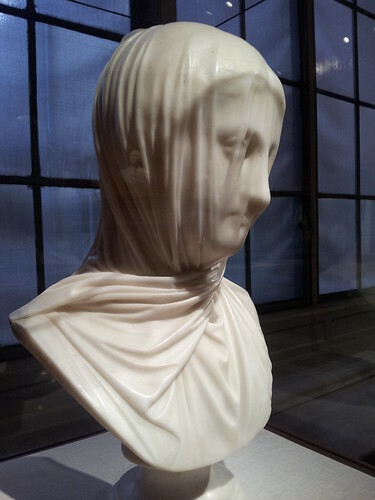 In the meantime, this is Giuseppe Croff’s The Veiled Nun, and that veil and her face under it is a solid piece of marble. Impressive, right? I finished off the weekend with an ice cream cone; a trip to the garden to water, harvest, and plant lettuce; and the premiere episode of Madame Secretary, which we both liked quite a bit. It was a full weekend! Category: dc life,life -- uncategorized. There is/are Comments Off on weekending. 2. Volleyball started up again this week and even if I wasn’t playing fantastically, I was still playing. 3. Corey was acting a little rambunctious on Saturday and I remembered that we had a couple of ribbon toys that we’d tucked away when it became clear he was incapable of not swallowing string-like objects if left unattended. I pulled out a wand that has a six-foot-long, polar fleece tail and soon had all three cats chasing and jumping in pursuit of it (after which, it got put away again, because Corey totally chewed it in half in the 15 seconds I wasn’t paying attention while we played). Category: three beautiful things. 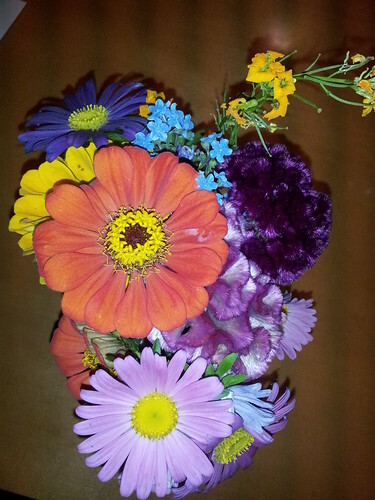 There is/are Comments Off on harvest, sport, and ribbon (and a bonus bouquet). Sometimes (when I remember to take a photo), Wednesdays are for sharing books and knitting projects as I yarn along with Ginny. Campaign season is upon us in D.C., as it is for many of you, too. For me, this means lots of time spent at candidate forums and endorsement meetings, which require something to keep the hands occupied and the body awake. The yarn, which I wound on a camping trip last fall while sitting in front of a fire, is Knitterly Things Vesper Sock Yarn in Autumn Sky, and as with all of her colorful, stripey concoctions, I am in love. She just emailed to say that she’s updated her shop and I am trying very hard not to buy all.the.yarn. On the reading front, we’ve got Alaya Dawn Johnson’s The Summer Prince, which I started earlier in the summer and which appears on my list of books to finish by next week. It’s sci-fi/fantasy/dystopian set in a future, matriarchal Brazil and focuses on a teen artist, June, and Enki, the titular character, whom we are informed in the prologue is elected to his position as consort with the understanding that he will be sacrificed after a year. It’s dark and, obviously, the further you get into a book with such a plot, the darker it’s going to get. I’m also reading and enjoying quite a bit Chicks Dig Time Lords (edited by Lynn M. Thomas and Tara O’Shea), a slim collection of personal essays, interviews, and comics about the women of Doctor Who, be they academics, fans, writers, actresses, or artists. I am a recent’ish convert to the long-running sci-fi tv show (we’re closing in on the end of Amy and Rory’s tenure as companions, so no spoilers, please), but my interest in gender studies dates back at least a couple decades. While the whole “chick” thing rankles a bit, I do appreciate the various perspectives presented by nerdy women. 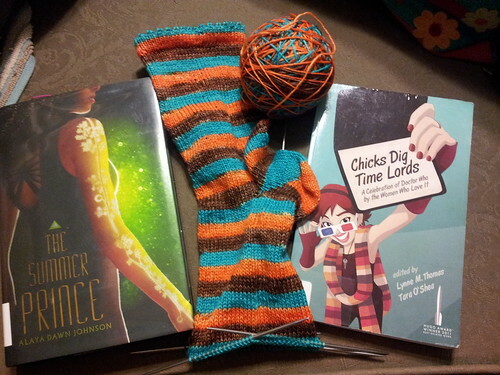 Category: books,knitting. There is/are Comments Off on yarning along: mid-september. Turning up for an early work shift at the garden to discover one of our fellow gardeners had gotten a jump start on filling the water barrels. The latest Harry Potter re-listen coming available from the library. The members sale at my local bookshop. Dinner at our favorite local pizzeria. Out of bed and biking off to the playground to meet some friends to start the day. A trip to the farmers market for a bunch of things including garden huckleberries, sorrel, and a foot-long Italian squash. An almond croissant and a cuppa for brunch. A s’more (made with a homemade marshmallow) and a cup of coconut juice (with coconut meat for later snacking) at a local street festival and meeting up with friends there. 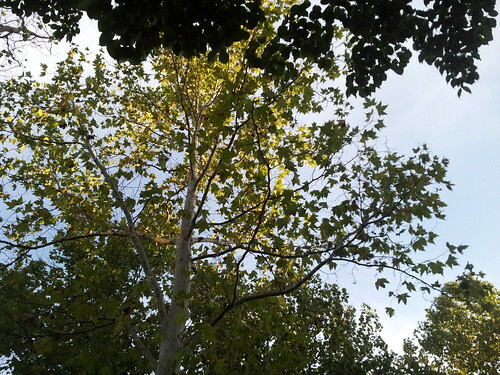 Talking to my folks and knitting in the park. Stopping for a cup of tea at a local bakery before biking home. A few new-to-me episodes of a favorite tv show. Chatting with Rudi as I ate my typical Sunday dinner of homegrown tomatoes and basil, mozzarella, olive oil, and baguette.